Fiamme Volpine clip from eva macali on Vimeo. 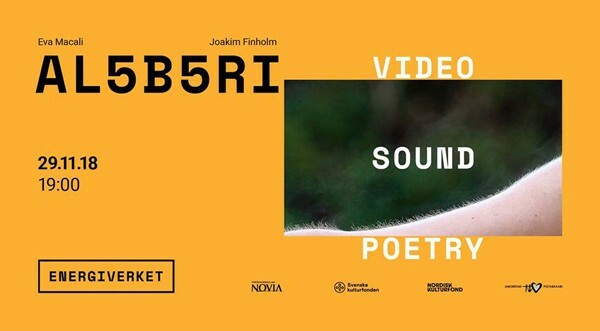 AL5B5RI is a cross-discipline project developed with Finnish film maker Joaquim Finholm on the subject of interdependence in nature, taking the cue from the tradition of sauna and the magnificent sight of aurora borealis. Three video art pieces focused on portraying the interdependence between natural elements have been exhibited at Energiverket in Jakobstad Pietarsaari in november 2018. AL5B5RI involves different media: poetry, moving image and sound. what is it like living close to them? The choreography in AL5B5RI film poetry is inspired by the yoga position vrksasana also known as tree pose, the vocal part is based on the poetry Al5b5ri and the sound is designed after recordings of wood. Löyly film poetry is born after the experience of sauna. Inspired by the semiology research of Zoltan Ludwig Kruse about the Proto-Indo-European language theory, the poetry Löyly witnesses the reverberation of the LE-EL seed sound in various languages. Fiamme volpine is a generative infinite loop video installation dedicated to aurora borealis. In Finnish mithology northern lights are created by the movement of a snow fox dancing in the landscape. The word ravuntolet can be translated with fox’s fires’ and fiamme volpine. This installation has been produced through a complex process. Out of the choreographies filmed for the Al5b5ri video a 3D model and subsequent particles model has been created. Each particle of the moving body of Macali has become an element of aurora borealis. The sounds of recordings of Finholm's sauna are processed in accordance.